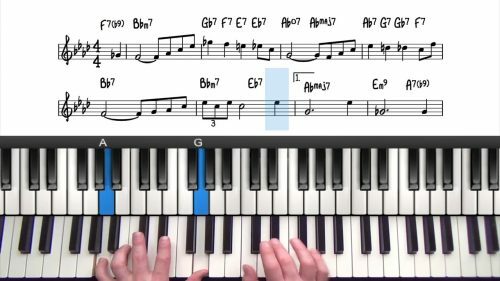 In this lesson we are going to explore the tune “The Way You Look Tonight”. We start by playing through with left hand voicings and then talk in length about the 1625 progression and how you can use it to develop introductions. This is a perfect tune to demonstrate this because the 1625 progression is repeated throughout the form. In part 2 we’ll be covering the usual stuff including, firstly creating bigger two handed voicings, and then incorporating upper structures, suspended harmony and passing chords. “The Way You Look Tonight” is an unusual jazz standard. It’s 68 bars long which is over twice the length of the standard 32 bars which most jazz standards follow. We’re still working with an A-A-B-A form, however each section is 16 bars as appose to 8 bars found in the more standard 32 bar form. The 1625 is a cycle. When you get to the V chord, you are drawn back to the I chord. This makes it easy to practice the progression because you can keep a continuous stream of music whilst cycling around the progression. 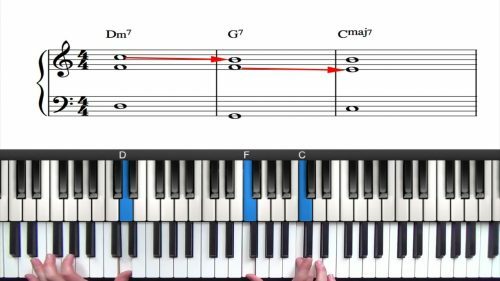 Whilst cycling around the progression, test out different upper structure triad combinations, different passing chords, introduce suspensions, tritone subs etc... you need to experiment. Listen to different versions of the tune and try to pick out lines over the 1625s in the form. Transcribe these lines. Analyse them. And finally transpose them into different keys. This is how you build vocabulary to play over a 1625 progression. Remember that the 1625 is also a 251 in essence, so any material you transcribe will immediately benefit your playing in many other areas.